Hippocrates is often called the father of medicine in Western culture. The original oath was written in Ionic Greek, in the late Fifth Century BCE. It is usually included in the Hippocratic Corpus. Scholars widely believe that Hippocrates or one of his students wrote the oath. Alternately, classical scholar Ludwig Edelstein proposed that the oath was written by the Pythagoreans, an idea that others questioned for lack of evidence for a school of Pythagorean medicine. 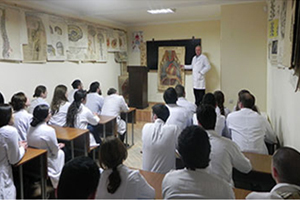 The Tbilisi Medical Teaching University HIPPOCRATES offers a truly international experience. More than one sixth of our students are from overseas, which means that all of our students benefit from living and studying in a diverse, global community. With respectfully, Tbilisi Medical Teaching University, Hippocrates, "the accredited institution of higher education, having reputable place in the medical education system. Tbilisi Medical Teaching University Hippocrates, graduated students will be having opportunity to undergo training at the leading hospitals in the United States of America and Europe as well. ,,Hippocrates "- provides scholarships for excellent students. Tbilisi Medical Teaching University, Hippocrates, having accreditation and legalization for foreign students 1 year ago and at this moment having 50 international students from different countries, including student from India, Iraq, Iran, Armenia. We provide an education of the highest quality that will challenge and stimulate, equipping you to become an independent learner and future leader. We will use tutorials and seminars to monitor your progress and assess your level of competence, and we will provide meaningful feedback in time to influence your next activity or task. •	The Teaching Medical University HIPPOCRATES incorporates state-of-the-art interactive teaching methods built upon the solid educational foundation that is central to the Italian academic system. •	Through the use of active learning methods (including Problem Based Learning, Case Methods, Simulated Patients and Concept maps), we train students to develop problem solving and critical thinking skills. Students are immersed in clinical environments starting from the third year. •	The six-year course has been designed to prepare students for all career options in medicine and research. Upon graduating, students will have the ability to work in any country in the EU. •	All classes are taught exclusively in English. 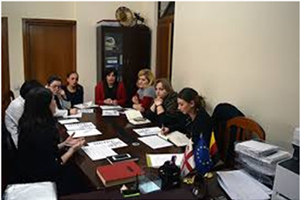 No preliminary knowledge of Georgian is required, however adequate Georgian language skills must be acquired before clinical experience.